6.89 points at 36 votes (rank 375). 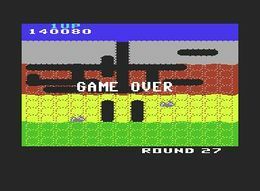 Rombachs C64-Spieleführer 8 1984 - "Vote 2"
This is a conversion of the game with the same name on the arcade machine and has been converted to the C64. The pawn, wearing a kind of astronaut suit, digs itself through the ground and must make enemies explode with the help of a pump. The alternative is to squash them with a rock. Next to the normal enemies, the Pookas, which kill when being touched, there are also especially mean ones, named Fygar. The Fygars can spit fire, even through the soil. If you give enough time to a Pooka or a Fygar, it will turn into a ghost and the soil won't pose an obstacle any more. If they then reach a tunnel, they take shape again. You look onto a cross section of a piece of ground. In it are hollow spaces where enemies are placed. Furthermore there are stones that fall down, when the soil beneath them is digged away. 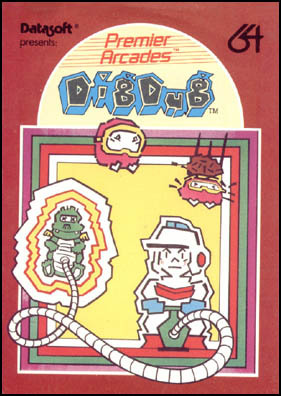 Dig-Dug starts every game with 5 lives. Squash the enemies with the rocks to get more points. If two rocks have fallen down in a round, a vegetable will appear in the middle of the screen for 10 seconds. If you reach it on time, you will get bonus points. The last enemy wants the escape from the area. Don't let the points slip through your fingers. The version by Remember contains next to the manual also the following cheat options: unlimited lives for both players, monster cannot kill Dig-Dug, rocks cannot kill Dig-Dug, jump levels. Dante: "An innovative game idea makes this game a classic. 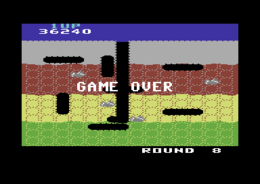 As a arcade machine it was already a success and the C64 portation is also lots of fun. Unfortunately, the diversion leaves a lot to be desired after a while, as the levels differ only slightly." Guybrush: "The game gets monotonous relatively fast, it is just from 1982, so the game was for its time still outstanding. 7 out of 10." Borna: "I got to know this game on an Atari VCS of a friend, when I had it on the C64 there was no holding back. Seldom has a game called up such grimaces contorted with pain in its players, e.g., if you tried to reach a rock while being chased by 3 monsters, but the rock was still hopelessly far away. Gnnnnnnnnaaaannnnngggnnnn..."
Robotron2084: "The same problem, that is already known from the Atarisoft version of Donkey Kong: the originally upright screen of the machine had to be stretched horizontally to make it fit onto a normal TV screen. Result: unelegant, slow gameplay. It is also as easy as a pie. No way: 4 out of 10 points." mombasajoe: "It was already too repetitive in 1982, to be good." Shakermaker303: "Quite ok for its time. At least 6 out of 10 points." Dig Dug in the Killer List Of Videogames.